Has it ever happened to you in your medical sales career where your customer asked you for one thing and you delivered something else, or vice versa? Miscommunications in medicine can be harmful to the patient and harmful to your business. 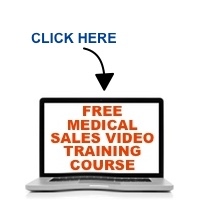 In this edition of Medical Sales Guru Podcast, Mace Horoff discusses a simple way to be a professional, deliver the right thing for the patient and healthcare provider, and CYA. It’s usually not a question of if a miscommunication will bite you in medical sales, but when. Here’s how to prevent it from happening. You’re in medical sales, pharmaceutical sales, biotechnology sales, durable medical equipment sales or other healthcare related sales and selling to healthcare professionals who can be somehwhat intimidating, so when you walk out of a sales call with a “maybe” instead of a “no,” you feel pretty good about it. But “maybe’s” won’t pay the mortgage, won’t help you hit quota, and don’t help the healthcare provider or the patient, so how should you handle “The Maybe?” In this Medical Sales Guru Podcast, medical sales speaker, trainer, author and consultant Mace Horoff discusses the only sensible way to deal with “the maybe” so you know where you stand with your clinical customers after a sales call.